I’ve just caught up – a little belatedly – with an excellent programme on the Yesterday channel – a two-part series called After Hitler. I was impressed by the exceptionally good script, the well-chosen archive footage and the effective narration. Among many important topics discussed, the programme reminds us that at the end of WW2 almost 11 million German servicemen finished up as POWs. A British major, we are told, wrote of the astonishing absence in Germany of men between 17 and 40. It had become “a land of women, children and old folk”. 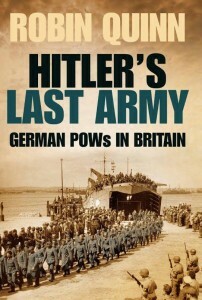 As many as 400,000 of the prisoners were held captive in Britain, and their experiences form the nucleus of my book, Hitler’s Last Army.